It was a good year, Canada made their nickel round again; the Fab Four had their first recording session; the movie Mutiny on the Bounty had just come out; everyone was singing “Big Girls Don’t Cry,” well everyone except my parents, only one of them had been born yet, and probably wasn’t singing much of anything; and subscribers who had paid their $1.50 annual fee ($2.50 for canada) had this issue delivered! I, obviously, wasn’t born yet, but based on the number of music related ads I just picture everyone singing! 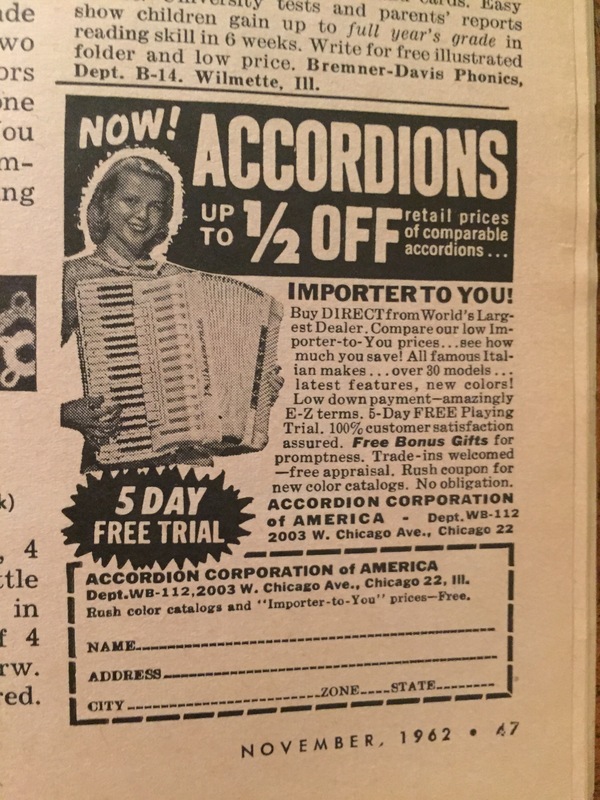 You could order a chord organ, accordians, or lessons to be your own music teacher. This issue really shows why I love these old magazines! The projects are lovely, the ads range from beautiful to hilarious, and I can just sit with a stack of them for hours, reading, laughing, and making. This issue has one of my favorite features, “Women Who Make Sense,” which has quick crafts intended for sale or bazaars. I hope to do at least one of the crafts from there, or at least tell you about them. The ads this month are just golden! I’ll be doing an entire post of my favorites. 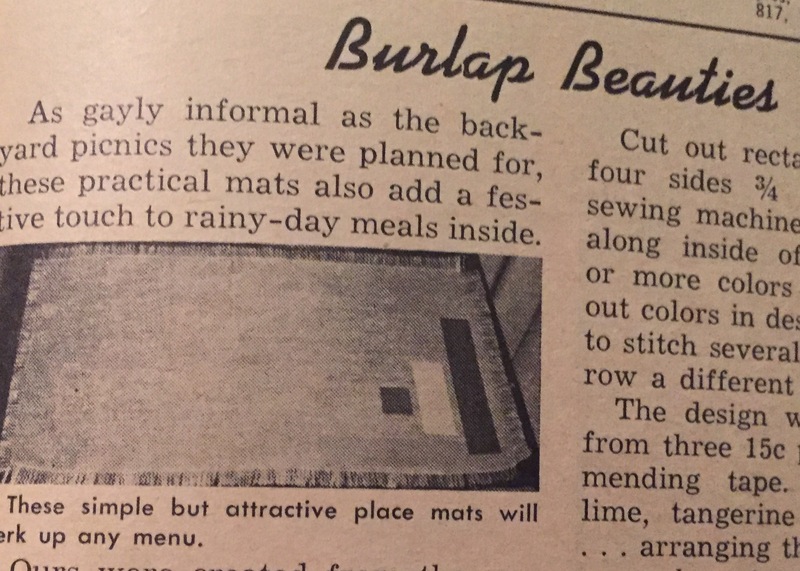 There is also a large article on huck weaving, so I’ll be giving that a try. This issue even has the gardening section I love, so you’ll be seeing some of my plants and yard hopefully. 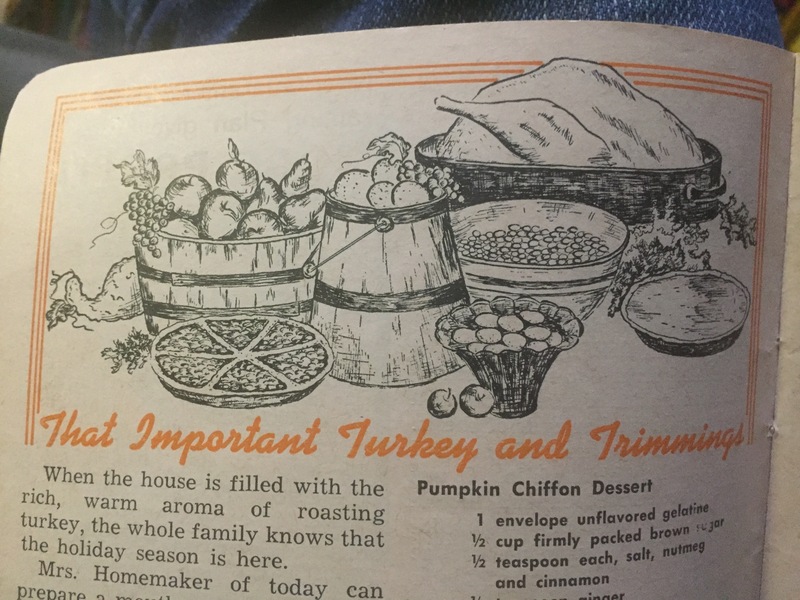 There is 17 recipes, mostly Thanksgiving or turkey leftovers related, so I’ll be doing some of those. If you’re not familiar with this magazine I think this issue will really show you why people still collect it all these years later, and why I wanted to do this blog. 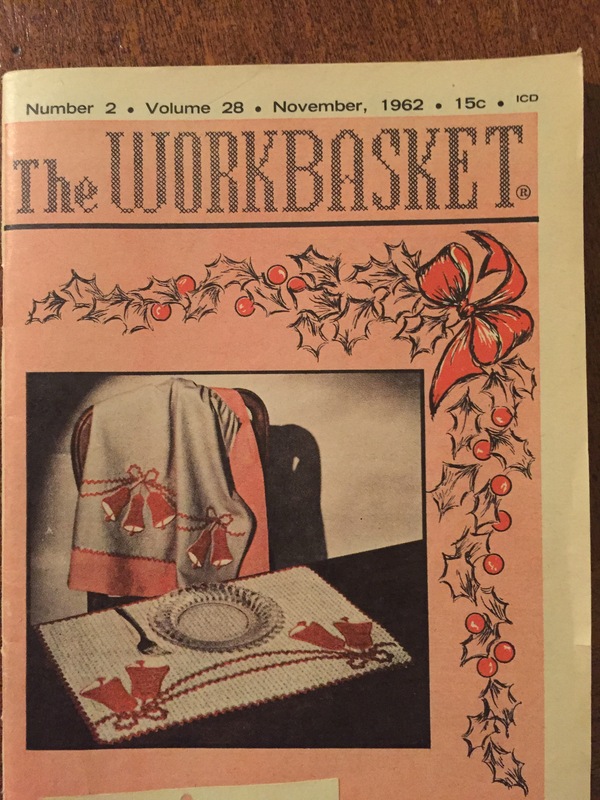 If you’re familiar with the Workbasket, I think you’ll really enjoy following along this month! If you have this issue pull it out and do a project! I’d love to see it. Next Post: Cold feet? No more! 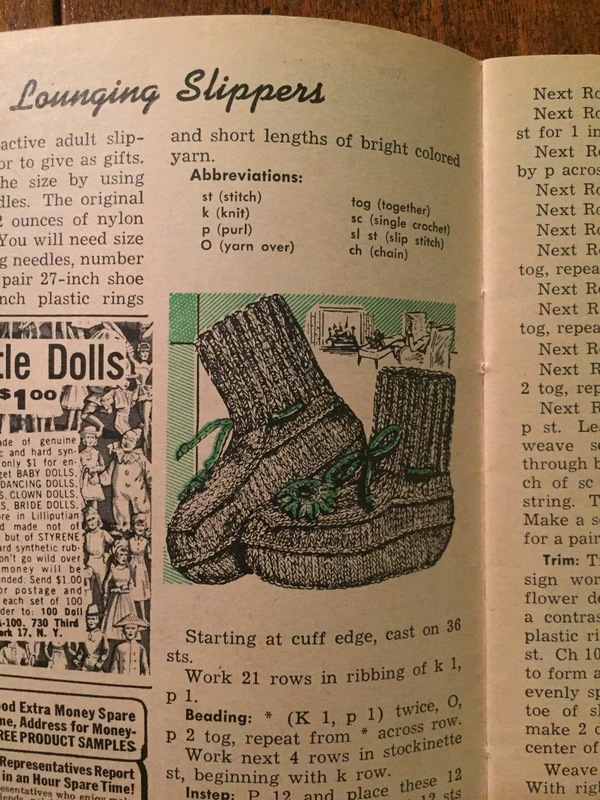 I have this issue and I think I want to try those slippers. And I will check those thanksgiving recipes. You’re in for a treat! I already finished a pair of the slippers and will be typing up the post tonight or tomorrow. There is a Turkey Salad recipe that is very similar to the Hot Chicken Salad I learned to make when my husband and I were newlyweds. It’s so good I still make it! 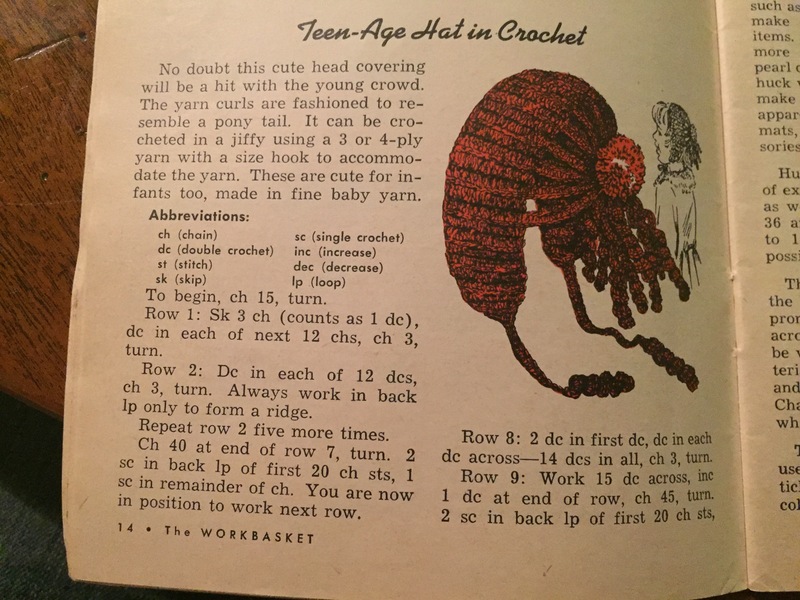 I made a ponytail hat like the one pictured for my daughter when she was little; she absolutely loved it and wore it any time she could. She was about five years old. I love this hat! I think it’s so cute. It’s the type of thing my Mom or Aunt would have made me when I was little. I’m working on one now and have a little girl I know modeling it next week for the blog. I can’t wait to see the hat! The illustration immediately made me think of Oods from Docctor Who but I bet its just the way it was drawn! It has a very ood look while crocheting it!